Production started 1994: 20 manufactured; 2 located Americas. After Tom Lack’s Catalac production ended in the mid 1980's, the company was reformed in the early '90's under the new name, Blue Water Catalacs. 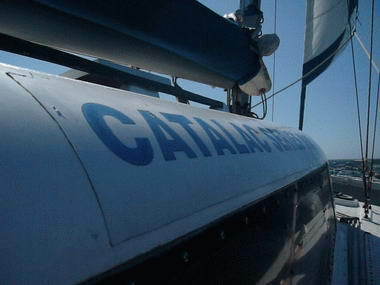 The old Catalac 9M moulds were sourced and it was possible to put the boat back into production under the new 'Catalac 900 banner. The Catalac 900 was a major rework of the twenty year old Catalac 9M design, with a sleeker and more modern look, achieved mainly by the removal of the old individual aluminum framed windows and replacing them with sealed full length tinted Perspex ones. 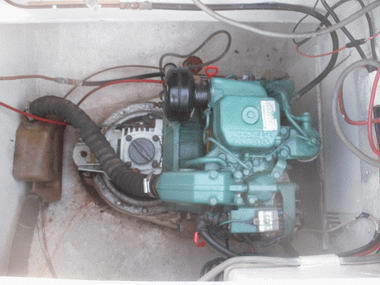 The boat featured other refinements like an enclosed helm, hot and cold running water as standard and the fitting of twin diesels (either Volvo or Yanmar units) with saildrive transmissions as standard equipment. Replacing the old shaft drive setup meant the engines were now mounted further towards the rear, allowing for a huge lazarette on the starboard side and allowing more space in the port side rear cabin. 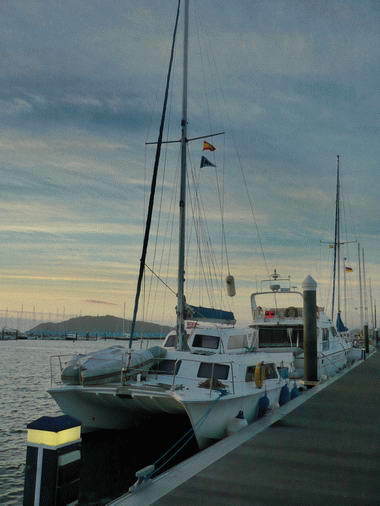 The biggest and most significant revision in the Catalac 900 however was the rework of the helm and ‘doghouse’ roof. This was now totally enclosed, with a one piece Perspex hinged door allowing access to the rear cockpit. 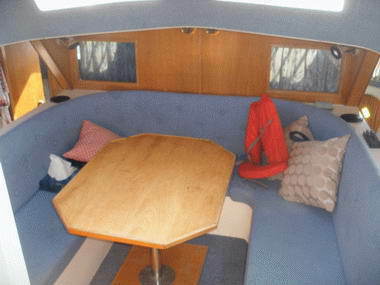 In the previous Catalac 9M, the rear of the helm position was open to the elements and a companionway door and sliding cover was used to make the saloon weather tight. This had the notable drawback of making the standing headroom in the saloon little more than 4.5ft once the hatch was closed. With the new Catalac 900, this was resolved with the saloon offering a light and spacious area to relax with full standing headroom throughout the boat. This layout will be somewhat recognizable to people who are familiar with Gemini Catamarans with one significant exception. 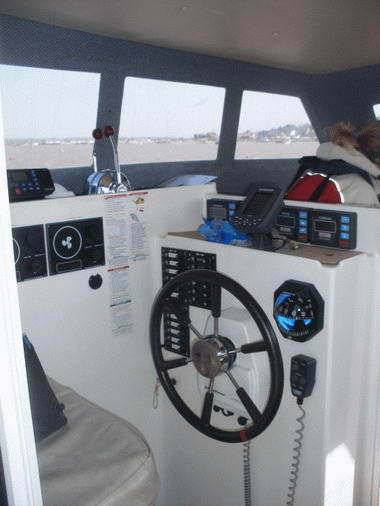 The Catalac 900 has a fully enclosed helm station within the cabin. The main layout was largely unchanged from the Catalac 9M and technically a Catalac 900 can sleep 7 people with separate double and single cabins over the bridge deck forward, a single ‘sea berth’ along the starboard hull, a single cabin in the port aft hull and the saloon converting to a double. 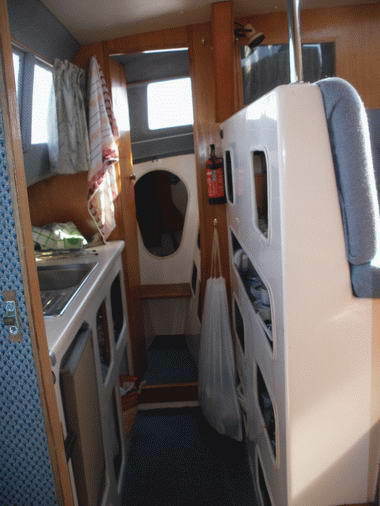 In reality, she is comfortable for three to four people with good galley space in the port hull and a decent sized head with shower in the aft starboard hull. What's interesting about the Catalac 900 is that many were sold as partially assembled 'kits'. Where it was up to the boat owner to specify how much of the boat was actually built by the Builder. As a result, some boats were built without the internal helm, and others included this helm but did not have a cockpit helm installed ... other boats have both. 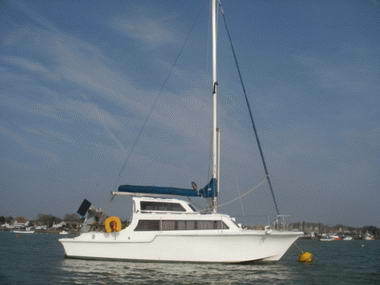 Engines were another item that were owner selectable, and as a result the boats appear on the market with either Yanmar or Volvo diesels installed. 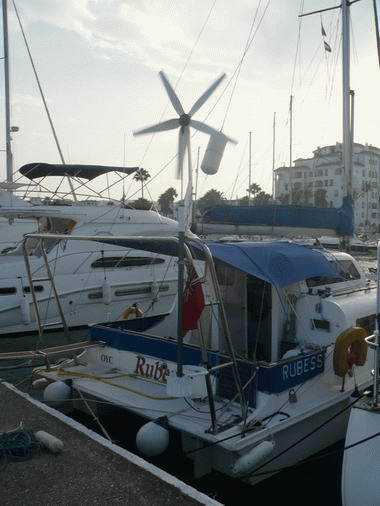 I personally purchased Rubessa in July 2011 and have since brought her down from the UK to the Mediterranean where I have carried out a number of revisions to make her a comfortable cruising boat. She was built in July 1994 and is hull number 905. 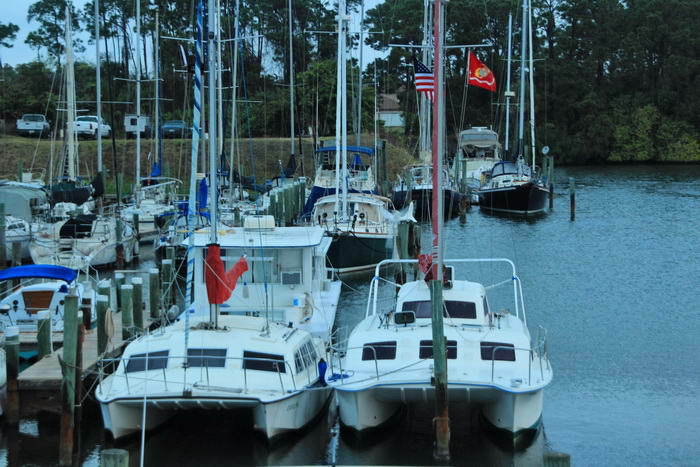 Only 26 of the Catalac 900 were ever made so the ‘905’ refers to her being hull number 5 of the new Catalac 900 series. Presumably they never intended to make more than 99 of them! Being lightly used for the odd weekend trip and being kept on a swinging mooring, she was never fitted with mains AC electrical power, radar or even a decent set of house batteries. I have since upgraded these, fitting a new ring main and RCD box with shore power connection, new standalone Furuno radar and a decent separate house battery bank. 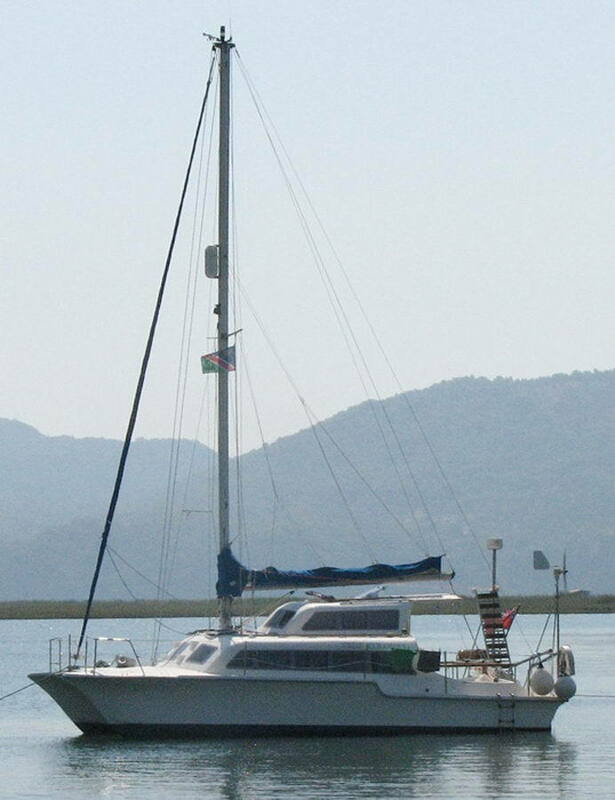 To make her as self sufficient as possible, she is now equipped with a 3000w pure sine wave inverter, a 2000w generator and a watermaker. The batteries being kept toped up by a combination of wind/water generator and solar panels. The largest, if not actually the most expensive (that was the watermaker), modification was the fitment of a large stainless steel ‘radar arch’, securely mounted to the rear bathing platform just behind the rear cockpit rail. This has simply transformed the boat and I would highly recommend any other 900 or 9m owner get one. It is the perfect platform to mount the wind and solar additions, as well as a good radar mount. The most useful thing about it though is it makes the perfect place to secure a bimini to, giving valuable shade to the large rear cockpit. There is still enough space in-between the arch to mount a 2.4 meter tender and allow for the fitment of a passerelle (boarding plank) to allow for stern to mooring in the Med’. 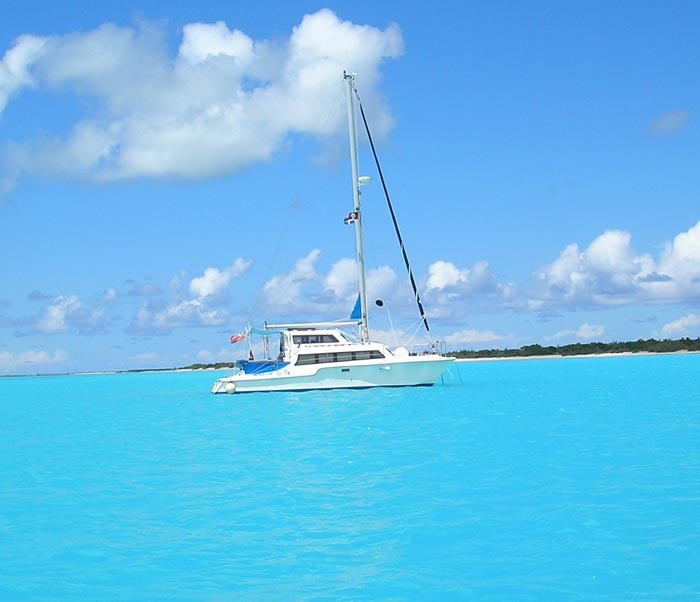 I have already sailed many hundreds of miles in Rubessa and can tell you that the Catalac 900 is a delight to sail, not the fastest boats in the world, 7kts is good going, but are very easy to single hand. I met her and the delivery skipper in Northern Spain and completed the trip down to the Med’ virtually nonstop for seven days. 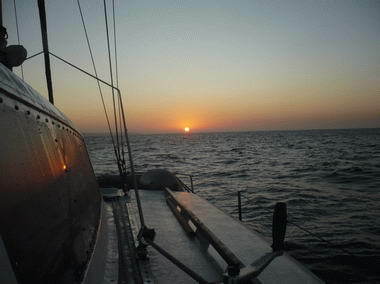 In that time, we encountered all the weather you could hope to go out in for a boat of this type, from fog, flat calm, force 4-5 crosswinds to a near force 8 gale behind us running down the Portuguese Atlantic coast. At no time did I feel nervous, well, once I was when we hit 18.1kts surfing down a 5 meter wave! 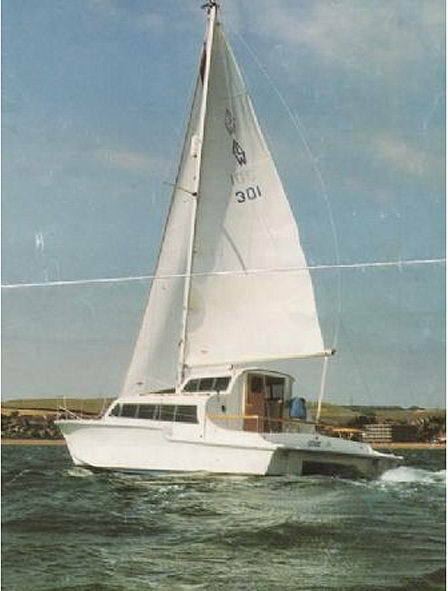 However, the Catalac 900, in combination with a new Raymarine autopilot, took it all in her stride, these boats were MENT to sail downwind! 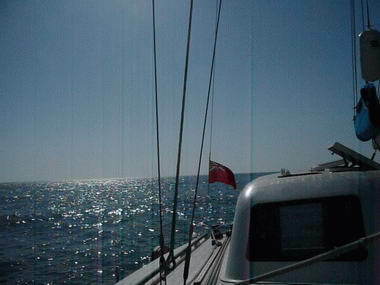 On the flip side, just like the 9m before and most other catamarans, they definitely don’t like upwind sailing. Not only do they not like going into the wind but if any waves are heading your way it will be very uncomfortable as well. The hulls are not only short but also feature a ‘hard chine’ on the bows, similar to what you’d expect to see on a powerboat. This is a giveaway at the hull design’s age and produces a lot of pitching and some very noisy slapping on the chines which can get pretty tiring after a few hours I can tell you! I would have liked an exterior helm, only two 900’s were built with this but since adding a wireless remote control for the autopilot, this is a minor want, I only need to go inside for engine control in tight spaces and found the fully enclosed helm a big bonus when doing long night passages. Another quibble, although minor, is the use of tinted windows all round. In the doghouse, this can severely restrict your visibility, both for night watches and more importantly, arriving at a strange marina after dark. Imagine trying to park your car at night with sunglasses on! Overall then, I’d highly recommend a Catalac 900. 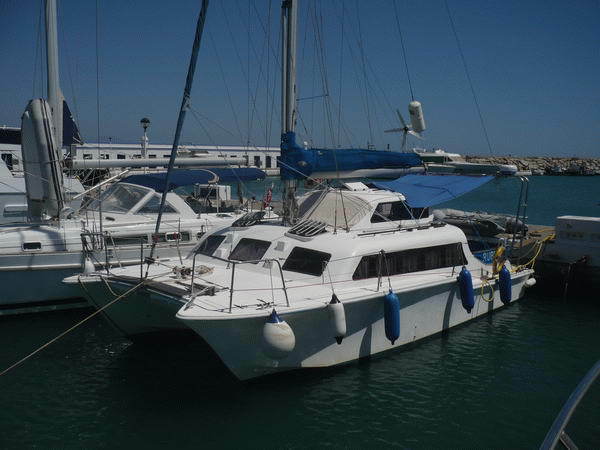 At the time of writing, a good one can be had for less than GBP 50k, great value for an easy family vessel or liveaboard cruiser.